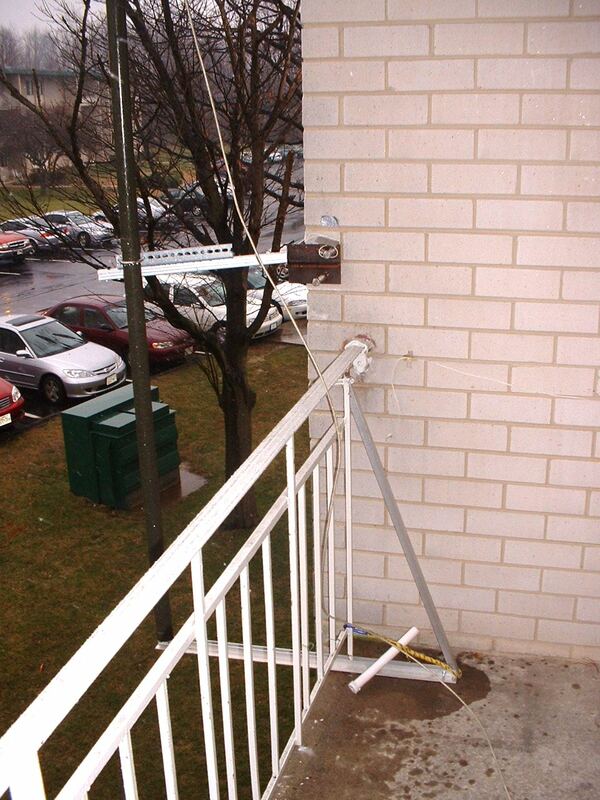 I wanted to get a VHF antenna up above the roof of my apartment building, but my balcony has an overhanging roof. Here is my solution. It's a clamp on antenna mast for an apartment building. A word about safety: DO NOT do this if it is windy, DO NOT leave it up overnight or unattended EVER! It is quite sturdy, but could be a serious hazard if it gets blown down or dropped, so keep an eye on it if you build something like this. Of course, stealth dictates that you only use it when you need it anyway. I am not responsible for anything you do to yourself, others, or anyone's property with this project. If you build it, build it well and check to make sure it is sturdy. Here's my 5 element homebrew 2m yagi on the balcony mast. My balcony is flanked on both sides by an 8" wide brick wall. This mast has two supports, a cantilever to support the weight and locate the bottom of the mast, and a clamp on arm about 4' up from that to keep the mast upright. The mast itself is (probably army) surplus stacking fiberglass. 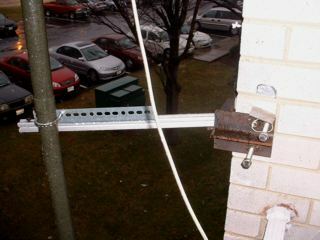 Here you can see the cantilever base and the mast clamp further up. The clamp is welded steel, cut from some I-beam scrap. I bought some aluminum framing (80/20) from McMaster Carr to use as the arm coming out from the steel clamp. A U-Bolt holds the mast at the higher point. The clamp is faced on the inside with soft aluminum so it doesn't do damage to the brick. Two 1/2"-13 bolts with nuts welded to the clamp provide the clamping force. A closeup of the clamp. The cantilever is made from 1/8" aluminum angle. It has a small round protrusion to mate with the bottom of the mast. 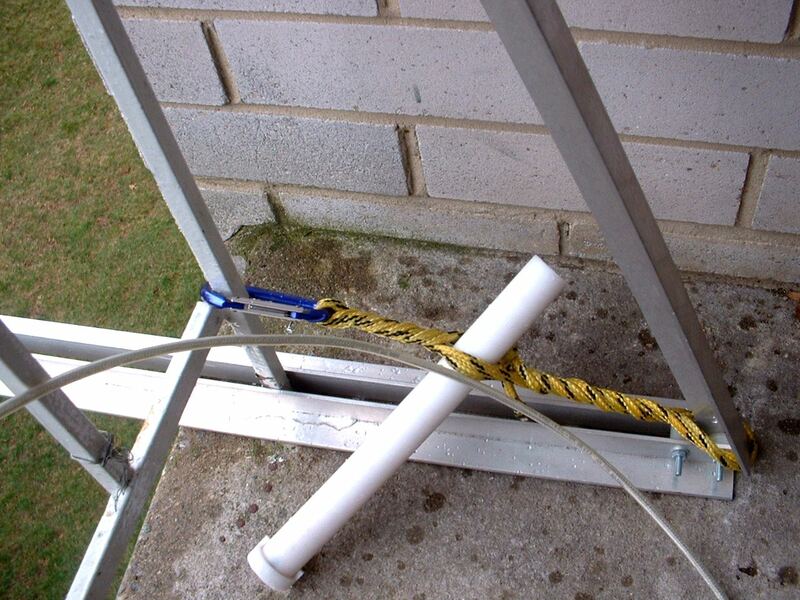 It is held in place by a brace that abuts the railing (actually at a hose clamp). A twisted rope pulls the whole thing tight, keeping the inboard side of the cantilever down with considerable force. A closeup of the inboard end of the cantilever with rope tensioner. 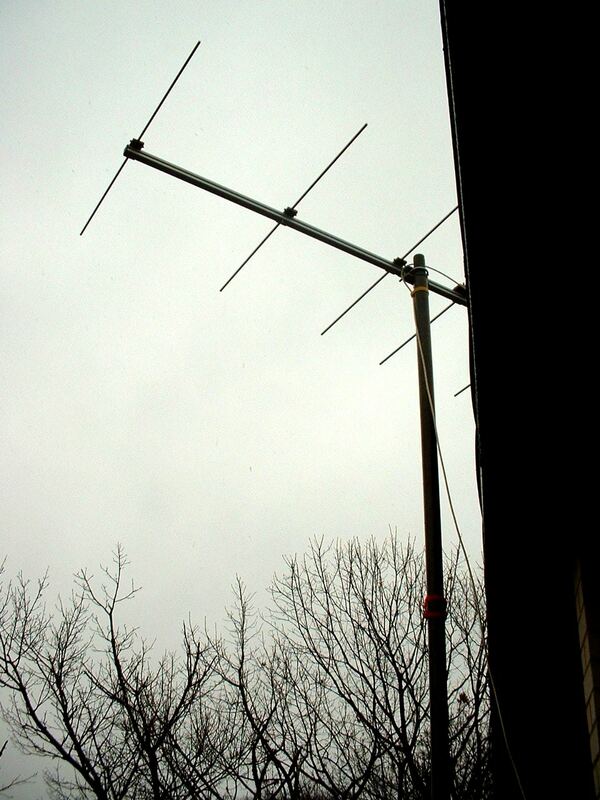 I put this up as an idea to get around antenna restrictions. It's not stealthy while it's up, but it goes up and down in minutes. Safety first on this one, folks. If you don't know about welding, etc, don't do this. 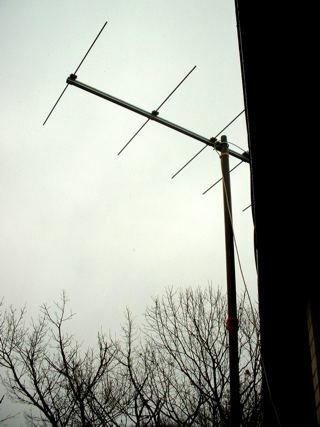 I have a VHF half square that I can put up instead that uses a bamboo mast just sloping out from the railing. It is much safer, as it weighs almost nothing and if you've not built a lot of stuff, it would be more up your alley.